Gloucestershire returned to the top of the South Group after scrambling to a four-wicket win over Sussex Sharks in the Vitality Blast at Hove. A slow pitch was perfect for their pace-off attack who set up their fifth win from seven games by restricting Sussex to 127 for 8 after Luke Wright had won the toss. Spinners Rashid Khan and Danny Briggs bowled with predictable accuracy to share four wickets but Gloucestershire, having been briefly displaced as leaders by Somerset’s win earlier in the day, enjoyed the extra pace provided by the rest of the Sussex attack and reached their target with ten balls to spare. Luke Wright, Sussex captain, said: "It was a stodgy wicket suited to their attack and we just didn't bat well enough on it. If we'd got to 145-150 we might have had a chance and I thought our bowlers did well to take it into the 19th over, but our batting earlier just wasn't good enough. "We needed to adapt quicker to the conditions because on those sorts of pitches Gloucestershire have a good attack and I thought they bowled very well. We've got another game tomorrow (Thur) against Middlesex and we'll be looking for a positive reaction." Sussex never recovered from a poor powerplay when they slumped to 27 for 4. Phil Salt (1) was run out by Michael Klinger’s direct hit from mid-wicket before David Payne picked up two wickets in seven balls including Wright (16) who hit four boundaries before mis-timing a drive to mid-on. When Michael Burgess fell for a single to Andrew Tye the Sharks were reeling but Laurie Evans briefly revived their hopes with 46 from 36 balls. Evans was just getting into his stride, having taken Kieran Noema-Barnett for a six and two fours in the 13th over, when he holed out to long-on in the 14th off former Sussex slow left-armer Tom Smith. 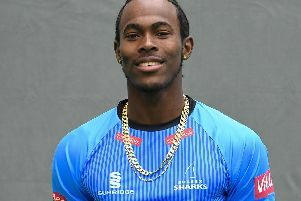 Sussex didn’t find the boundary again until Jofra Archer cleared the ropes off the penultimate ball of the innings, the only boundary not scored by either Wright or Evans. Archer’s unbeaten 26 gave Sussex a glimmer of hope but even he was becalmed by an excellent attack with Payne and the experienced Tye outstanding. They were backed up by a tigerish Gloucestershire fielding display. Sussex needed early wickets to have any chance and Khan struck with his first ball when Klinger (13) edged behind in the fifth over before deceiving Ian Cockbain (4) with a ball that skidded on in his next over. When Miles Hammond (35), who hit five fours and a six, was lbw to Danny Briggs trying a switch-hit Gloucestershire had lost 3 for 16 in 3.2 overs. Noema-Barnett (16) hit Briggs for two sixes but was bowled off a bottom edge in the same over and when Archer returned to the attack in the 15th over he immediately had Howell (13) taken at point. Jack Taylor settled Gloucestershire nerves by hitting successive boundaries off Jordan in the 17th over to effectively settle the outcome and although Higgins (21) holed out to deep cover in the 19th over Gloucestershire were only three short of their target and Gareth Roderick drilled the next ball to the long-on rope to seal a deserved victory.